I was particularly intrigued with the outre spirit photography of which William H. Mumler was the undisputed master around the 1880s. Both the wacky photo trend and the parallel spiritualism movement, which originated in upstate New York and migrated to Europe, is a strange chapter in our history: talk about your willing suspension of disbelief. I mean, really! 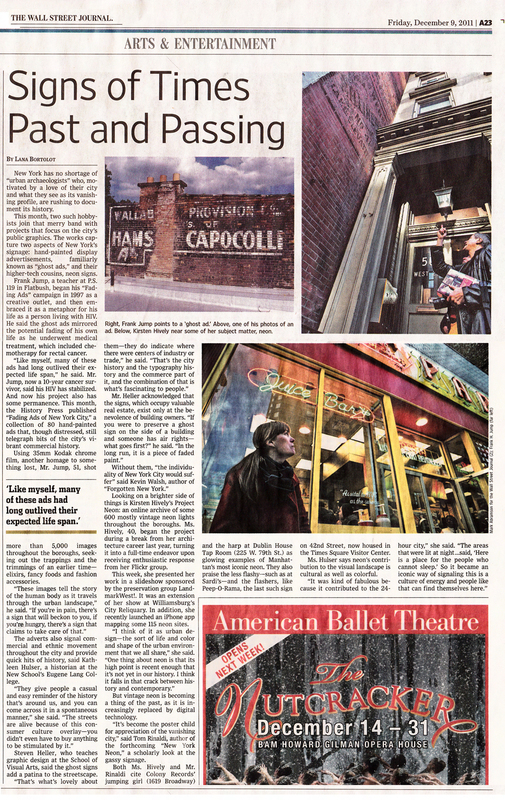 A STORY I DIDN’T POST about previously, and which [sadly] has now departed, was about David Levine’s fine pop-up performance theater in the Essex Market last month. “Habit,” a 90-minute play, ran for 10 days at the end of September, as part of the Alliance France’s Crossing the Line festival. 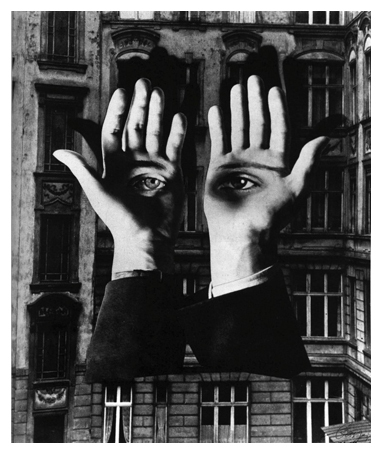 The continuous eight-hour loop of American drama allowed viewers access at any time, and freedom to experience it however they wished (sitting down, standing up, peering through various windows … for eight minutes or eight hours). No two performances were the same, nor could they be: The script was the only thing scripted about the show, and the actors created the drama on the spot, neither knowing what would unfold in the next minutes, nor how the curious play would end. I stopped in for a bit on my birthday and watched a scene through the living room window where the three characters pretty much tore into each other Noah Baumbach-style. Which is to say, “ouch!” It was nice to see that people had problems greater than that of aging another year. Online here at WSJ and PDF here. WHEN I HEARD ABOUT the Bowery Poetry Club closing, I winced for a few reasons. First, I’m not really an “out with the old” kind of person. I dislike seeing any meritorious nugget of history or culture chipped at—especially when it’s unlikely the succeeding “thing” will ever be as distinctive as the original. The question, “Do we need another frozen yogurt chain or whatever trend du jour?” is too oft-asked these days. Second, as a writer and long-ago English major, any diminution of literature tugs a little at the heart. Though I don’t write poetry, I have friends who do, and hearing there’s one less place for that art—especially in New York’s spiritual home of poetry—is like the sickening thud of another independent bookstore closing its door for the last time. And what a nice segue into the plight of St. Mark’s Bookshop. The store’s rent woes are well-publicized, as is the local community’s support of the store, an anchor not only on that rag-taggy little street, but of the whole neighborhood. What Coliseum Books and Gotham Book Mart were to their neighborhoods, St. Mark’s is to the East Village. I popped in last Saturday to check out the cash mob benefit organized by Jeremiah Moss, and one of the owners, Bob Contant, very kindly consented to an interview on the spot. Actually, he brought me to the basement, a warren fashioned from stacks of books, magazines, CDs, and in its way, much more fascinating than the public floor. A strange jazz-inflected Japanese music played softly somewhere, source unknown. On Bob’s desk sat a yellowed PC with its orange-lettered DOS interface. New technology upstairs, but down below, still the hands-on way of doing things. It wouldn’t have surprised me to see a tattered manual ledger somewhere. Any number of on-the-ground reports will tell you that what’s happening to St. Mark’s Book Shop isn’t personal, and, these days, not uncommon [EVGrieve] [Vanishing New York]. Bob, too, was dispassionate about it, more of the “what are ya gonna do about it” shrug of someone who knows you can’t fight City Hall. Or Citibank, the kind of tenant that could afford that space. Bob and his business partner are committed to staying in the neighborhood: They just can’t pay $23,000 a month in rent to do that. They’ll also have trouble coming up with the $23,000 needed to move the store to smaller quarters, assuming they find them. That’s a lot of books to sell. And that’s why some community residents have kicked in, and why crowdfunding platforms are becoming the way small businesses can continue doing business. It’s no small irony a place like St. Mark’s can’t turn to the hometown bank, say, a Chase or Citibank—likely those are the competitors for the prime real estate the bookstore occupies. The news on the Bowery Poetry Club isn’t all bad. Owner Bob Holman, the “dean of the scene” in the East Village, hopes to reopen the club in partnership with a burlesque club. There will be fewer nights dedicated to readings, but the arrangement creates an opening to mix up poetry, food and cabaret, and attract new folks who come for the martini and stay for the slam. It’s fitting not only because of the Bowery’s vaudeville heritage, but because the village’s other legacy is the mother of [re]invention. Happily, other places of poetry are thriving, even if the places in which they were historically produced are shutting down around them. While long-time literary haunts Holiday Cocktail Lounge and LIFE Café closed down, places such as Nuyorican Poets Café, the Poetry Project at St. Mark’s in the Bowery and KGB still uphold the spoken word. I’ve given you a long trailer. But don’t let that stop you from “reading the movie,” so to speak. In WSJ on Wednesday and in PDF form here. WHEN WRITING ABOUT OLD PROCESSES such as some of those on display at Photoville a few weeks ago, it’s easy to slip into a nostalgic space that pines for obsolete things and damns the technology that (usually) antiquates them. 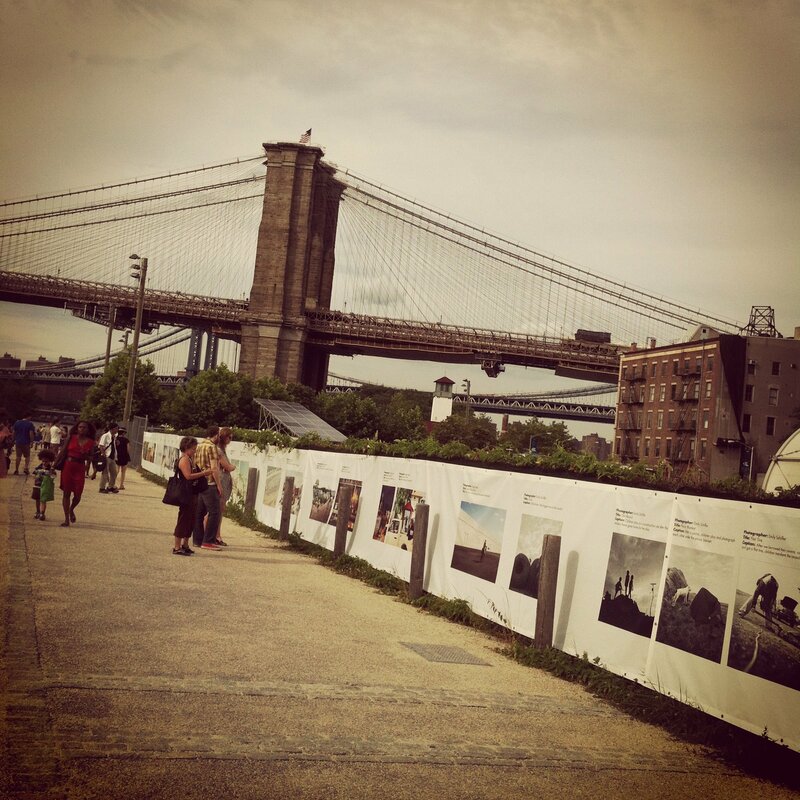 That’s why the inaugural Photoville festival, a celebration of all things photographic, intrigued me. I wanted to see technology and art and narrative forms playing together in the same happy space; Lomography and tintype celebrated as much as slick multimedia storytelling, emerging photographers sharing the stage with doyens. I imagined a loosely curated gathering ala Brooklyn Flea—complete with food trucks. But as every reporter knows, once you start digging around, other stories are revealed. So, in talking to photo folks about all this, I came to a notion that Dumbo—the new technology, as it were–might usurp the old Flatiron photo district. 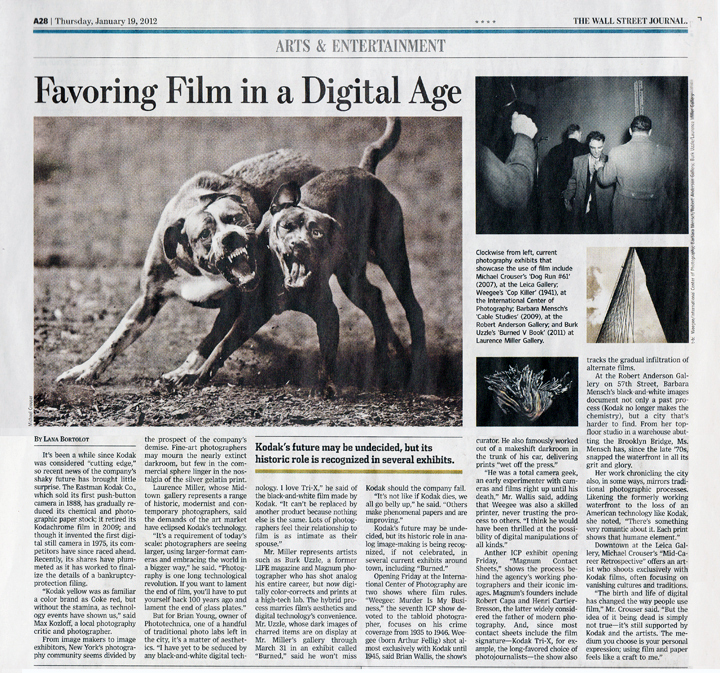 Having spent quite a lot of time around photographers and in darkrooms, transitioning from analog to digital, chemical darkroom to digital, I had more than just a reporter’s interest in it. The developing story [no pun] became a prurient check in, akin to spying on the new neighbors in your childhood home. New York City’s place memories are familiar: designers scuttling garment racks around the Fashion District or cellists veering their wheeled instruments around Lincoln Center. My own such memory of the Flatiron is photographers emerging from loft studios with yellow manila job envelopes or Ilford boxes tucked under their arms. Or, peering through photo lab windows, seeing them inspecting contact sheets through loups, their faces wreathed in fluorescent white light at the communal light tables. Now, much of that business of photography is done by digital transmission, in sleek offices, not labs with the stinging smell of developer. Much has expanded into other disciplines so that photographers are also designers and publishers, or they’re multimedia producers. Photo booksellers are gallerists and gallerists become event producers, making the very formerly segmented field of photography into a very large conversation. Anyway, all of this is to say, this story turned out to be about old and new, about how what works for some doesn’t work for others, and about how the photo district will always cycle through the city and depend not on bricks and mortar or a place of manufacture, but of imagination and opportunity. And cheap rent. Right now that’s happening more in Dumbo than on 23rd street, in large part through arts-marketing and the vision of a well-funded developer who could help subsidize a cross-river migration of the photo community. But, as some moving to Dumbo find, it’s one thing to build it and another to have people come. Events such as Photoville and the New York Photo Festival, a Dumbo-based photo fair, combine a pleasing look at the past and optimistic peek into the future, but also underscore a need to remind the public that imaging-making is a serious business. You can read my Wall Street Journal story here or [PDF]. THE RECENT ONLINE CAMPAIGN conducted by Partners in Preservation raised some interesting issues about haves and have-nots. Backed by a $3 million corporate donation, the organization invited people to vote for one of 40 restoration projects throughout the five boroughs. The sites ranged from the Solomon R. Guggenheim Museum and the Brooklyn Public Library to an obscure statue in Queens (the Rocket Thrower) and an A.M.E. church in Staten Island. I faithfully voted for sites in Queens, my borough of residence nearly every day of the month-long campaign. In the end, four of the five sites in Queens finished in in the lower one quarter of the rankings. My favored site never hovered about rank No. 27 (1% of the vote). The Louis Armstrong House Museum performed best, finishing at No. 13 (2.66%). Was it voter apathy in Queens? An unawareness of the campaign or the sites? Or, did the voting reflect the acumen of people with large online networks who could spread the word and the votes? Because of where I live and what I report on, I hear plenty of complaints about Queens not getting its share of the attention: Our landmarks are ignored, our cultural institutions are under the radar … Here was a chance to make a difference and few stepped up to do that. I was intrigued with the Astoria Dive Pool, which landed in the latter half of the overall popular vote. I grew up swimming in fresh-water lakes in northern Vermont, so pools have always been a luxurious novelty to me. My mother, a New York City kid, spent her summers in these large pools, where she remembers having to rent her bathing suit. The dive pool sits near the larger pool where my mother may have learned to swim. It’s one of 11 New Deal swimming holes constructed under Parks Commissioner Robert Moses, himself an avid swimmer. It’s said that Moses had a particular affinity towards this complex, and equipped it with state-of-the-art amenities and sanitation systems. It’s no small irony that the safe haven overlooks the treacherous Hell Gate strait. A long-abandoned relic, now the pool collects stagnant water and attracts mosquitoes and askance looks. It’s also attracted the attention of city and community officials who want to restore the Art Modern diving tower—the only one of its kind in the city—and transform the pool into a performance space. It’s already set up for spectaculars: the 1936 and 1964 Olympic diving trials were held here, and in the 1940s, the Aquazines, a swim and stunt team performed here. The online fundraising campaign asked for $250,000 to restore the graceful tower, which cantilevers over the pool. You can read my story for the Wall Street Journal here if you’re a subscriber or here for the PDF. 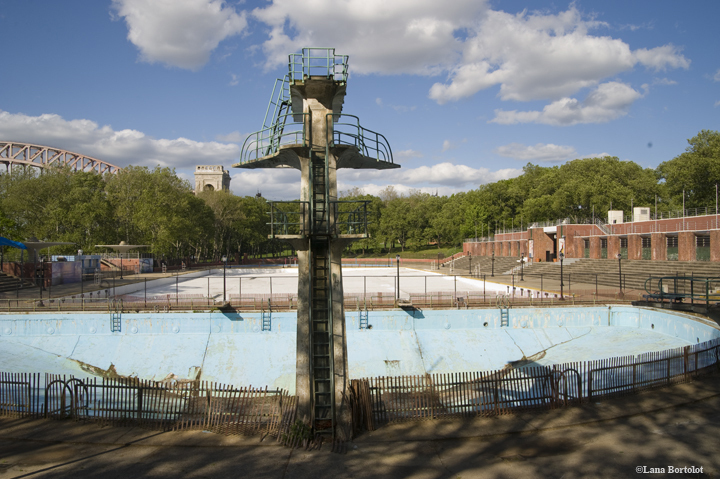 Beyond the Olympics, the pool is a crumbling reminder of Queens’ diving history: Johnny Weismuller, Eleanor Holm, Esther Williams and Gertrude Ederle, the first woman to swim the English Channel, all performed at the Aquacade at the 1939 New York World’s Fair. They all made stops in Astoria. Though lots of people know about Astoria’s siren charms, they keep them to themselves like a secret handshake among the initiated. And so Astoria sustains its reputation as destination for Souvlaki or its Slovak beer garden, lodged in a space that isn’t quite like Archie Bunker’s Queens and definitely not Truman Capote’s Brooklyn. Don’t get me wrong: I love the old-worldliness of the neighborhood, but I experience occasional twinges of Brooklyn envy. That borough proved that Manhattan no longer has a presumptive status when it comes to culture, gastronomy or quality of life. Here’s a chance for Astoria to have its own come-uppance. We are a neighborhood of great potential, derelict landmarks (the World’s Fair pavilion, the rapidly disappearing antebellum mansions, the nearby Steinway Mansion), and a muffled desire to somehow combine the two. IF I WEREN’T FORCED into the modern age by my profession, which requires spending time with all things digital, I might chose, instead, to roam the world (or the world that is New York City) with an analog camera. I did that for a long time, until the photo darkroom where I printed for nearly eight years recently closed its T.A. program. During that time, I and about 35 other film fanatics, shared a community darkroom at Pratt Institute, and a love for the black & white print. It sounds precious, yes, but anyone who has ever made a print feels a small heart tug recalling the dreamy, slow sliding of an image onto blank paper. The darkroom, a place where all you did is count the time—nine-second exposures at the enlarger, two minutes in developer and fixer—also created a time warp. A day in the photo lab was a snug asylum away from the pressures of the bright modern world, and whenever I emerged with a blotter book full of damp prints, I was calm and neutral as if, in those hours, an even exchange between creating art and purging anxiety had passed through me. One show I purposely did not mention is the current exhibition at the International Center of Photography, “The Loving Story: Photographs by Grey Villet.” The small exhibition, as everyone now knows, features 23 prints of Mildred and Richard Loving, the interracial couple who sued the Commonwealth of Virginia for the right to live in their home state as husband and wife. LIFE magazine assigned Villet to the story in 1965. Even though it had a good track record covering civil rights, LIFE held the story and when it published it the next year, used only a few images. At that point, the Lovings were making news—on their way to the U.S. Supreme Court, but it was also a time when only 4 percent of the population approved of interracial relationships. LIFE played it safe holding the essay until it was a news story, and then, showing a loving (no pun) family waiting in limbo. Villet died in 2002 without ever obtaining the fame his LIFE colleagues did. Though he shared a masthead and roamed the halls with the most renown shooters of his day, he stayed the fly on the wall. Now that posthumous task is up to his widow, Barbara, who still lives in the house they bought in 1961. She’s made it her life’s work to ensure her husband gets the acclaim he deserved. 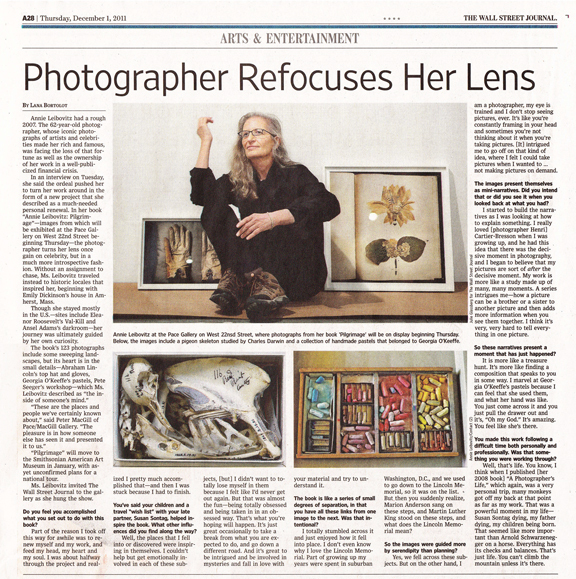 She invited me and WSJ photographer Daniella Zalcman to her home 200 miles north of New York City to see his photo archive. Barbara Villet’s 19th-century house is a tumble of rooms filled with photos and her husband’s sculptures (Grey was a talented wood carver and bronze caster), so it seems that he’s never far. Her bed, awkwardly positioned in the middle of the bedroom, takes advantage of the wide river view through a wall of windows out back. There is a stone marker in her backyard with her husband’s name on it. GREY VILLET LIKED ANGELS. A stylized wood-carved angel bearing a long trumpet hangs above the desk in Barbara’s studio. You can make the symbolic connection. He was also a furniture-maker. In her studio, there’s an rough-hewn old-fashioned flip-top student desk upon which he carved, “Where do the winds blow your words?” It’s where she stores his assignment sheets from LIFE—oversized pages typed out in uneven courier, some stained with cat pee. Mugs, a highly protective rescue dog, trots around after his mistress, planting himself at her feet when she sits and throwing low, throaty grumbles our way when we get too close. He shares the premises with two cats—one chosen and the other an insistent stray that strangely won her over. She had tried to rid herself of him several times, but recalled that her husband once told her he wanted to come back in another life as a cat. The two have since settled into each other. And that’s how Barbara describes her relationship with her husband. They met on assignment and knew within three days they would marry (he knew on day 1, but it took her two more to come around to the idea). “We were joined at the hip,” she said more than once in the several conversations I had with her. More than husband and wife, they were a journalistic team that worked in sync to produce some of LIFE’s memorable stories: “The Lash of Success” (in an anthology of LIFE’s greatest essays), a 50-page essay covering three generations of a Vermont family, and many other deep and humanistic examinations of American society. “Working with him was magic! My job was to listen and to get the words. We both favored what people were doing and saying, and not ourselves. So I was big on getting as many verbatim quotes and listening, listening, listening to what people said while he was watching, watching, watching what they said with their hearts. It was really very easy to work with Grey. I never had any strain at all with him. For some reason, it was like sensibilities and we both knew it. Then the shutter stopped clicking. When LIFE ended, so did a significant part of their charmed career. “He was very ill at first after LIFE folded because it was like standing on a pinnacle and then the whole thing collapsed under him, you know. But we weathered it. And then we got the Airstream and that was a godsend for both of us. We packed it up and went to Mexico. We were a pair of gypsies. He didn’t shoot anything. He did carvings on the way. I don’t think I did anything but read. We just lazed around. LAST MONTH I WROTE about two projects by New Yorkers that chronicle disappearing signs of the city. Frank Jump, a Facebook friend via preservation circles, recently published a book on the city’s fading painted signs—those giant advertising banners on the sides of buildings for tonics, elixers, food stuffs and whatever else was the currency of that particular neighborhood, such as needles and zippers in the fashion district. Franks’ project, interestingly, also parallels his own observation of a life disappearing: He is a cancer survivor and living with AIDS, which he says is now stabilized. Frank’s vital signs are OK, but those he’s documented on the outside will eventually slip from our notice through neglect or the crush of the ever-developing city. I can’t remember how I heard about Project Neon, but Kirsten Lively’s documentation of all that glows aptly suits her name. She shows us a New York at night that many of us just walk by, taking for granted these glowing treasures. Grimy and dull by day, neon owns the night and, in turn, harkens others who want to do their business or pleasure when the sun goes down. Living in a lighted city, I had forgotten what I love about old neon: the lazy and unpredictable glide of gasses through the tubing, the irreplicable colors (there’s no “neon pink” in the Crayola box), and the unique type styling. But I love it most as the quintessential beacon to night’s pleasures—an illumination into places that are otherwise dark, a promise of excitement, the chance to create your own giddy film noir moment. You can read it at wsjonline.com or download the PDF here. I KNEW THE IMAGES before I knew the photographer—the iconic pictures of John Lennon and Yoko Ono, Demi Moore and my favorite, a sassy Ella Fitzgerald with a leopard skin tucked under her arm. 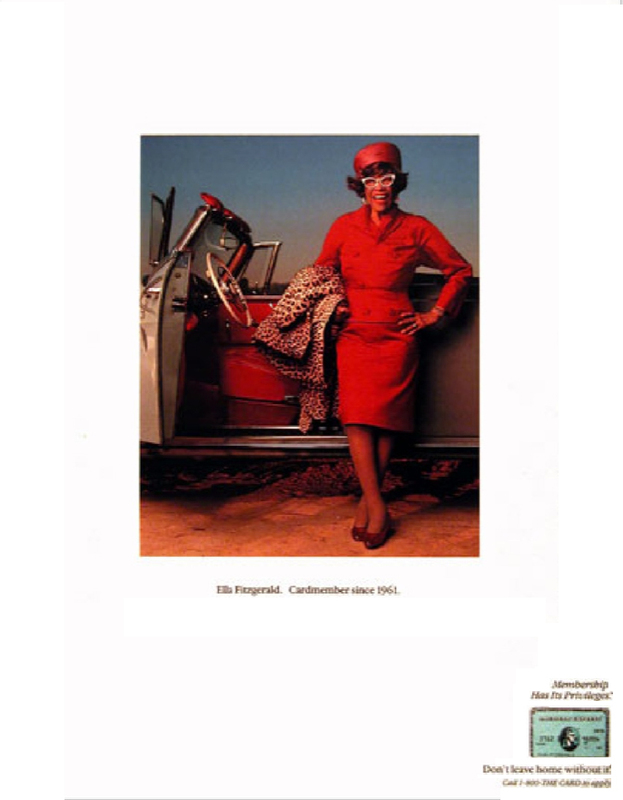 And then sometime in the 90s, anyone following pop culture or photography or seeing Vanity Fair on the newsstand, saw Annie Leibovitz become as celebrated as the people she shot. I met her last week at Pace Gallery—me jet-lagged from travel in Italy and she doubly distracted by the hanging of her show (in town only three days, a sort of pop-up show), and her daughter’s dental surgery. 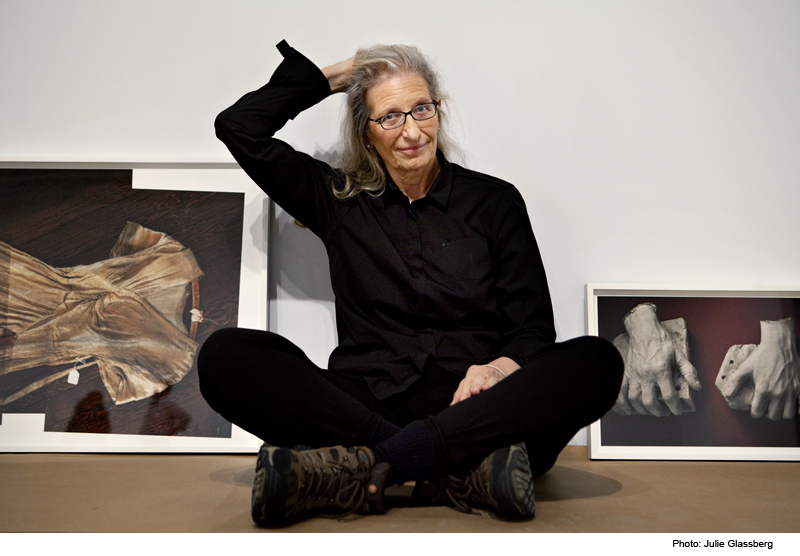 We sat on the floor of the gallery and talked about her new work, which, while about famous people, doesn’t include any. Her new book, “Pilgrimage” peeks inside the spaces of people she admires, and documents the things they left behind. 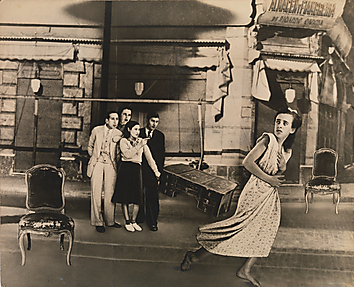 The images set up narratives that seemed as though someone just left the frame. In some scenarios it looked like the owners of these goods were coming back in some kind of time-travel fantasy—Georgia O’Keefe might pick up her pastels, Annie Oakley might step into her riding boots and stride off or Emily Dickinson would slip her prim, embroidered dress over her head. Other stories you couldn’t imagine a life re-activated: the top hat and blood-stained gloves Abraham Lincoln wore on this last night to the theater. 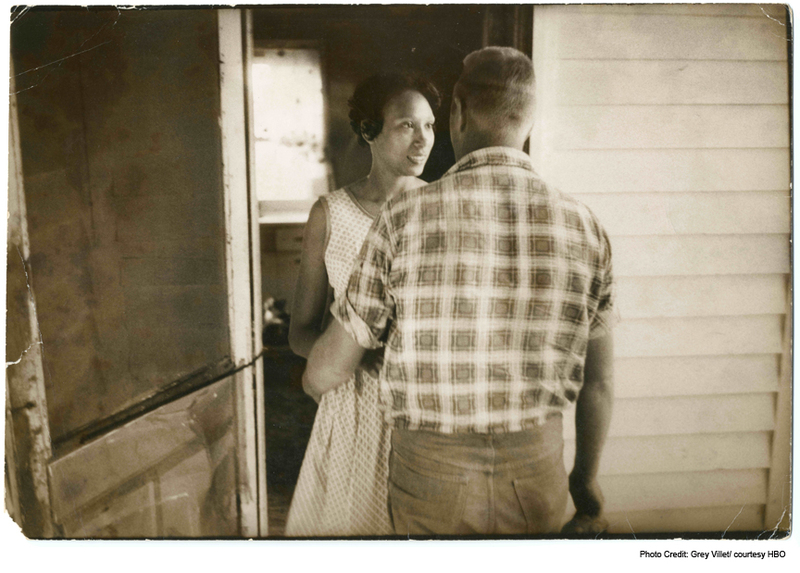 The book also includes landscapes, but I think these intimate looks into the lives of others are more curious. You can read the story from The Wall Street Journal two ways: PDF of the online story or PDF of the print version (recommended for the visuals alone).